You wonder where exactly to have your elopement ? Even though Europe is a small continent (not to our eyes though! 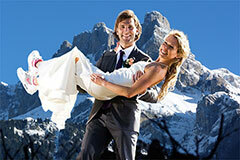 ), it holds a wide range of exquisite locations for your elopement. Europe being were Romanticism was born, you will find surely on the continent the best place to celebrate your love ! You probably have seen its rising shape in a romantic movie. Well, today is your chance to choose this same spot as your wedding location ! Eloping is about putting your couple first : few or no guests or family, intimate ceremony, love above all. Well, this is exactly what your could get at the Eiffel Tower. This famously romantic venue is an amazing location for celebrating your love, one of the world’s top destinations for a small, unique moment. 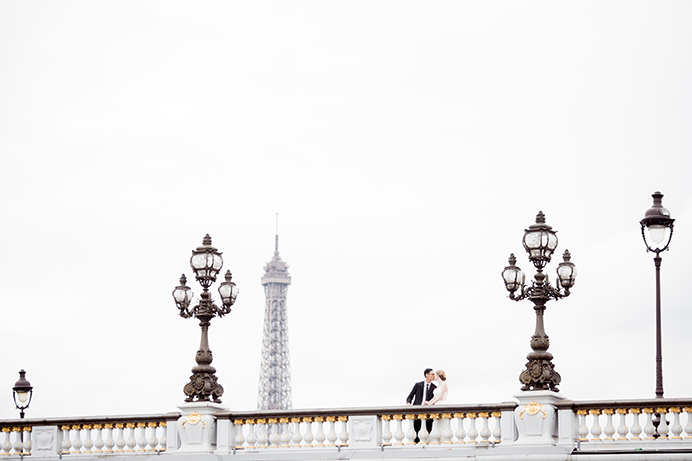 At Love Gracefully, over 10 years of celebrating weddings, we have selected a few intimate spots to make sure you get the most of this special day in front of the Eiffel Tower. You might not know this, but the Iron Lady, as we call it in France, is surrounded by parks. One of them even shelters a small lake that will add an even more romantic feeling to your symbolic ceremony. Some couples surprised themselves by daring an “unexpected” elopement in Paris right in front of the Tower, as they testify in this video. Surprise yourselves is the best gift you could get on your wedding day ! Let you dream come true and dare celebrating your love at the Eiffel Tower ! Notre-Dame cathedral, Paris most treasured religious building, is an amazing setting to hold your elopement. Built in the 15th century, it holds a high level of authenticity and solidity. A great symbol to shelter your wedding vows. The Cathedral has majestic shapes and just makes a stunningly romantic background for your love commitment. Plus, because you are choosing this kind of celebration and your family might not be so happy about it, the Cathedral will guarantee that you get amazing photo memories capturing the uniqueness of this moment to share with them afterwards. The church is a cherished location for our couples wishing to elope. But even with over 300 wedding vows celebrated, each celebration is a brand new one. Born in this capital city, we have, over the years, selected the best spots to give you the most of the church, while allowing you to dive into an intimate celebration in Paris. You could choose to have your ceremony set in the garden at the rear of the building (a great spot early in the morning or late afternoon). But you might also love to have your symbolic wedding, set right by the river, on the riverbank, overlooking both the church and its famous lover’s bridge. How to choose the best elopement destinations ? Are you wondering how to make your elopement special ? Well, travelling abroad is for sure a great idea. There are numerous stunning romantic locations to have symbolic ceremony in Europe. Some couples will prefer Paris, some others will favour Barcelona or Rome. Whatever you choose (and we will be here to help you in there! ), at Love Gracefully, we will celebrate your love where you want to have it. European cities offer an wide range of top rated locations. 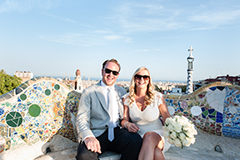 Wether you’d like to celebrate just the 2 of you on a beach and have your honeymoon there, or in one of Europe’s beautiful cities or even in the mountain or by a lakeshore, the options are plenty! One thing is for sure : eloping abroad with a symbolic vows ceremony is the best way to have an intimate celebration. That way, you will have all the time to focus only on each other! We have had fantastic reviews from many couples who chose to celebrate their love with us. Have a look at this couple’s video who decided to elope by Notre-Dame cathedral. Can you picture yourself exchanging your vows with your lover, right here, at the heart of Europe ? We can’t wait to see you here ! We have celebrated over 300 elopements, vow renewals and weddings, in Europe. We have witnessed love in big cities like Paris but also in smaller ones, on the beach (Barcelona, Monaco Monte-Carlo, Nice, …), or in the mountain (Chamonix, Geneva, …) for love has no boundaries ! Over the years, we have built up a strong expertise that we will be happy to share with you, for we are the oldest elopement company in Europe! What makes us different is that, unlike our competitors, we don’t work from template elopement texts; but rather, we create each time a new ceremony to fit exactly who you are. Our local celebrants are all English-speaking and real professionals; there are not students or part-time actors working for us. Plus, we will coordinate for you, at no extra-charge, all the different elopement vendors included in the ceremony package you will have chosen (more details about the options). This means that we will come up with the best marriage photographer, film director, car, flowers, etc. Our priority is to create a ceremony with the highest quality for the lowest price! An elopement that you will remember all your life! If you haven’t told your family yet that you are going to elope, here is a tip: Since they love you, they would want to be there for your ceremony. But, one thing you can tell them is that you are eloping just for you. Of course, you will share with them, afterwards, the videos or photos of your marriage, and these will be memorable. Also, for your wedding ceremony, there is a financial issue; if you have a big wedding at home, it’s going to cost you a lot of money and that’s a very strong argument you can tell your family; it’s much cheaper to have an elopement ceremony abroad rather than to have a big wedding at home. And, last but not least, you could come and have an elopement in Europe, and also have a small wedding ceremony at home! That way everybody is happy…! We have selected for you the most popular destinations to help you navigate between all the available options. Europe might be small, it is replete with dreamlike stunning locations to celebrate your love. For a friendlier use, we have also designed 5 types of elopement packages, each including different services (a photographer, flowers, a car, a film director, …). They are all inclusive and are the key to an affordable symbolic ceremony abroad. Feel free to click to see the different packages options, and select the one that would best fit you. The beauty of this system is that, for your convenience, wherever you are, you pay the same price ! We are at your disposal would you have any questions. At any time and at no charge !